 The First Grade program at Dade Christian School provides the basic foundation of learning for every child. A child’s study habits, learning skills, and attitude toward education are formed during this primary stage. Our curriculum is a thoroughly integrated, academically balanced program with a consistent Christian emphasis. Bible, Language Arts, Phonics, Reading, Math, Science, History, Spelling, and Penmanship all represent the subject areas. Our total program has been developed to challenge students to develop their skills in the intellectual, spiritual, physical, and social realms. An emphasis is also placed on social interaction among the students, giving them opportunities to develop social values; respect, sharing, group acceptance, independence, and dependability. The purpose of the first grade science class is to nurture the student’s exploratory curiosity for science through projects, conducting experiments, and reading. The students will understand about the world God created and how each organism has a purpose for existing. Biblical principles and truths from God’s Word will be integrated throughout each lesson. The purpose of first grade history is to provide an awareness of how fairness, honesty and courtesy are needed to work cooperatively with others in a community. Students will understand about how the different jobs in our cities, states and nation play a role in keeping us safe and well. Children will appreciate the diverse cultures that surround us and how this diversity enriches our lives. To identify characteristics of good citizenship such as a belief in equality and responsibility for the common good. The students will learn what schools are all about, why they have rules, about the school workers, where it’s located on a map, about schools long ago and today, putting things into groups, schools around the world and what jobs are. The students will also learn about being good citizens, our rules and laws, who are our leaders, finding states on a map, our country’s presidents and how we make a choice by voting. The students will learn about America’s symbols, fiction and nonfiction information, portraits of good citizens, their rights and responsibilities, and how communities honor their citizens. The students will also learn about what a neighborhood is, how to use a map key, what landforms and bodies of water are, how to locate land and water in a map, recognize what globes and maps are, identify continents and oceans of the world, find directions on a globe, people and resources, saving our resources and about houses and homes around the world. The students will study all about people having different roles: how to solve problems together, families basic needs, what is culture, similarities and differences in cultures, how to use a map scale, how people celebrate, how to use a calendar and that we are Americans. The students will learn about the past and present time: people and places change over time, how to use a time line, trace a family history, use a diagram, and learn a community history. The students will continue to learn the past and present time: America’s first people, our country’s history, how we celebrate the history and people who made a difference, how to follow a route on a map, how people contributed to the history of our nation, about the differences between life today and life during the pioneer days. The students will study jobs people do: their goods and services, requirements and characteristics of a job, how to use a picture graph, why people work, how and why jobs change, about buyers and sellers, how to use a bar graph, wanting more or less, making choices when buying, and trading with others. The purpose of first grade Math is to set the foundation where upper level math skills can continue to build upon. The curriculum and its correlated materials teach that arithmetic is mostly all ruled-governed activities. The common-sense approach fully accords with Scriptural principles about orderliness and authority. The teaching materials for Math also abound with specific examples aimed at Christian character building. The importance of mathematics in their everyday lives is instilled. problems with how many are left, how many more, and the missing addend. The purpose of the first grade spelling curriculum is to introduce word lists to the students through the use of spelling patterns. Students learn to decode words through Phonics and Language development. Enhancing students’ ability to spell will enable them to write words, sentences and stories that will help them reach their creative writing potential. The purpose of first grade Phonics is to set the foundation for the students’ future reading success by mastering the phonetic rules and using them as building blocks to whole word reading. The students will be exposed to word analysis consisting of syllables, contractions, antonyms, synonyms, word families, sight words, homonyms and compound words. The students will understand that the Word of God can teach both children and adults life-long principles that can be used in their every day life. Daily Bible class includes memorizing Scripture verses, listening to Bible stories, praying, and singing. Students will come to know about the person and life of Jesus Christ. As they gain knowledge from the Word of God they will also build Christian character.